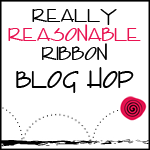 Welcome to the RRR April Blog Hop. This month the Really Reasonable Ribbon Monthly Ribbon Club Assortment is gray and yellow. Isn’t this a great color combo??! I don’t know about you, but I’m so ready for summer!! I had a fun summer digi stamp set, so I came up with this card. I used several of the styles from the April Ribbon Club assortment including some of the Elise White Crochet Lace along the top and bottom of the center panel. The crochet lace and layered ribbon around the middle of the card are adhered with Scor-Tape which works great with ribbon. Both the little bow from the Confetti Dot Grosgrain and the bigger triple-loop bow made with Lemon Delicate Stitched Satin were made using my Bow-it-All Tool. Everyone who loves ribbon should have a Bow-it-All. You’ll have fabulous, stress-free bows for all your projects! If you have not seen our Bow-it-All Tutorials, please visit the reasonableribbon YouTube channel HERE. Here is a little peek inside my card. I added a strip of the Light Silver Satin Crosshatch Ribbon along the bottom edge. Such a fun and sunny card! I love this months blend of yellows and greys. I really, really, really hope I win! Love your bright and sunny card! Just makes me feel warm. The ribbons are so perfect.Love it! Your card makes me smile! I love the promise of summer and I see it throughout your creation. Your card is very cute! I love the yellow and gray combo! I was just thinking springtime cards and projects when I saw the ribbon collection this month, but your card really sells summer and I love it! I will retire this May after 38 years in teaching and it really will be time for my endless summer vacation to begin! Thanks for giving me a sunny lift on a cloudy day! Love this great combination of sunshiney papers and ribbons! The chevron paper is such a great foil for those delicious ribbons. Super dimension, too. Pretty, pretty! Oh wow Bonnie, I LOVE your card. So clean! Great job with adding so many of these fun ribbons. I love the card layout and the stamps! So pretty. Thanks so much for having me as a guest this month!!! I love the grey chevron paper with the yellow. The ribbons are gorgeous! Thanks for sharing with us. Hey Bonnie love your card the dp, colors and of course that yummy ribbon! This was an awesome hop thanks! Oh wow this is gorgeous and the bow just scrumptious. Love the composition of your card. The colors, patterns and LOVE the bows.